Tired of getting fur in your car on the way to drop your dog off at the groom shop? Hate leaving them in a tiny cage all day around other dogs that may have fleas or diseases? Wish you didn't have to waste your gas driving to pick them up later? Maybe your dog is ready for a nice summer hair cut to keep them cool? 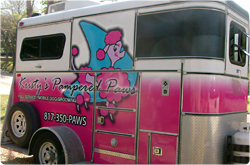 Kristy's Pampered Paws is a family owned and operated local mobile pet grooming salon. We come to you! We offer everything a full service groom shop does except we can do it in the convenience and comfort of your own driveway! We also have TWO groomers for each appointment – every other service only offers one. We understand that some of our furbabies have special needs and having both of us there at the same time helps tremendously. (The pets definitely like the special attention also!) Maybe your dog stresses out at the groomer, allowing them to smell and see all the familiar scents and sights of home sweet home helps alleviate stress while grooming! Kristy's Pampered Paws provies the best dog grooming, cat grooming and pet grooming in Fort Worth! Kristy's Pampered Paws offers a huge variety of grooming services from the basic bath for the stinky dog to the deluxe spa package complete with massage and "pawdicure" for the spoiled dog who is more like a member of the family! We offer de-shedding treatment that gets rid of 90% of that excess fur you find all over your clothes, your furniture, your floors and your car! We also offer breed clips, summer shavedowns, nail trims & painting, flea treatments, massages and a variety of wonderful all-natural shampoos to choose from!